It is the end of term and I’m hopelessly behind on any number of deadlines (I’ll get those book reviews done in December!). On a personal level, I guess I’ve forgotten all those past Novembers and repeated my pattern of not being quite organized enough. As a result, I’m repurposing these quotes and the question I posed to my 20th Century Europe students during our class discussion about Appeasement on Friday for this blog post. Appeasement, of course, is one of the “key” lessons from history. We need to avoid repeating the horrible mistakes made by Chamberlain and Halifax. Just this week, Fox News and their ilk have proclaimed the nuclear agreement with Iran the worst error since 1938. This, of course, is just the most recent example of people endlessly using Appeasement to advocate aggressive foreign policies (George W. Bush, Margaret Thatcher). But, are they learning the right lessons from this historical example? Can history really be boiled down to a slogan? Are there laws of human behavior that repeat themselves in every situation? Isn’t the real lesson of history that is it messy, confusing, contradictory and not susceptible to simple theorizing? 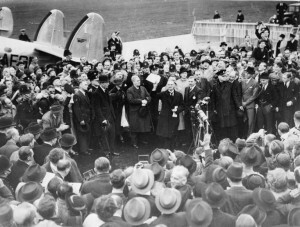 Appeasement remains a hotly debated and complicated historical issue. Were Chamberlain and Halifax naïve fools or were they actually pursuing a rational policy of buying time to rearm, knowing full well that Britain would likely need to fight a war with Nazi Germany? There is a lot of evidence supporting the “buying time” perspective. If that is true, the debate shifts into counterfactual historical questions: were they right to assume that delaying the war from 1936 to 1938 to 1939 and finally to 1940 improved their ability to fight the Germans; would a war over the Rhineland in 1936 have gone much better than a war over Poland? We’re into the typically muddy waters of historical debate. No easy lessons here. This complexity is what I try to teach my students about history. I’m not sure I’m equipping them with the knowledge to avoid repeating all the errors humans made in the past. Now back to prepping lectures on the Fall of France and the War in Russia.